Unless you were living under a rock (or, um, not yet born), you’ll know that the Spice Girls were everywhere in the late nineties. The group has since lost a member, broken up, gotten back together for a reunion tour, and, more recently, teased about another comeback. If you missed them the first time round or are nostalgic for those halcyon “girl power” days, then we bring good news: a Spice Girls exhibition has opened up in Angel, London, boasting over 7,000 pieces of memorabilia (including those iconic outfits, the coveted dolls, and the original Spice Bus). Here’s everything you need to know before you go. At the Business Design Centre on Upper Street, just down the road from Angel tube. From July 28 to August 20. General Admission is £10, with concessions and children aged between 12 and 16 getting in for £5. If you have kids under 12, you can begin their immersion in iconic nineties pop culture for absolutely free. Or, if you’re a true aficionado, you can have a guided tour for £20. Tickets can be bought on the door, or beforehand online. The exhibition, which has received official sign-off from the Fab Five themselves, is packed solid with Spice Girls stage costumes, memorabilia and merchandise. 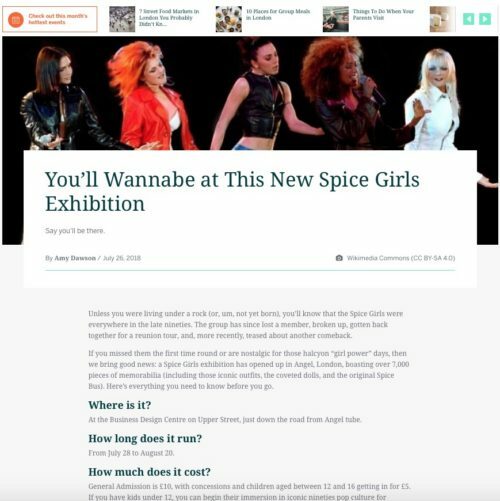 Expect to see plenty of high platform Buffalo boots, crop tops and leopard print (thank you Scary Spice) and a vast array of memorabilia ranging from Spice Girls branded Impulse spray (the smell of the 1990s) to dozens of different dolls. The show is broadly arranged by theme; covering single releases, live performance, official merchandise and solo careers. SpiceUp London is the brainchild of lan Smith-Allison, who admits he has spent well over £100,000 collecting at least 7000 items of Spice memorabilia – he paid £700 for a set of Viva Forever dolls alone. The superfan has teamed up with various fellow collectors to mount the show, but the majority of what’s on display comes from his private collection. What SpiceUp London lacks in multi-sensory, immersive razzle-dazzle it makes up for in deep Spice fandom geekery. A huge highlight is the original Spice World movie bus, rescued from dereliction and refurbished to some of its former glory, which will be parked outside for the duration of the show. There’s also a great stage which has been set up to look like a Spice fan’s bedroom from the 1990s, covered in Spice Girls wallpaper with a Spice duvet cover and inflatable chair. While Geri’s iconic 1997 BRITs Union Jack dress (crafted from her sister’s tea-towel) is too difficult to get hold of, designer Suzanne Neville has loaned the Union Jack frock she created for Geri at the 2012 London Olympics instead. You can also see Mel B’s steampunk style Spice Up Your Life outfit, and the LBD Posh wore in the Wannabe video. Covering two floors, it’s not a huge show, but the time you spend exploring it will depend on your levels of Spice Girls devotion. The casually curious could nip round in less than half an hour, but if you’re likely to be entranced by Spice Girls lunchboxes and cake-toppers then you should set aside a full hour or more. There’s no doubt that the show has been a personal labour of love, so don’t arrive expecting anything like the kind of slick curation you might have experienced at major museum shows organised in collaboration with an artist’s estate (David Bowie at the V&A, for example.) But if you were a major Spice Girls fan back in the day, this is a fun and heart-warming trip down memory lane.